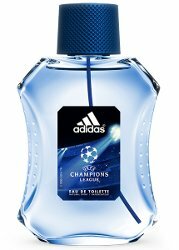 Adidas has launched Champions League, a new fragrance celebrating the UEFA Champions League and styled as a "hymn to modern masculinity". Notes include lemon, lavender, violet, clary sage , green apple, cashmeran, vanilla, patchouli and moss. Adidas Champions League is available in 50 ml Eau de Toilette and in matching grooming products. That bottle… would make a great water bottle. Probably doesn’t appeal to everyone, but I think that’s the idea.